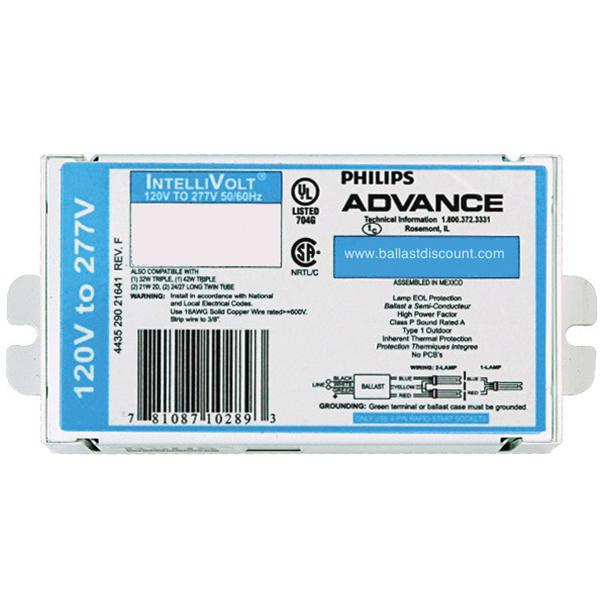 Philips Advance SignPRO Electronic fluorescent ballast is suitable to use with one/four 110-Watt T12/HO lamp. It has voltage rating of 120/277-Volts and current rating of 2.26-Amps. Instant start ballast with 0.61 ballast factor, has ignition time of 0.1 sec. It features metal BL2 housing. Ballast accommodates solid wire of size 18-AWG. It offers 0.98 power factor. This ballast has parallel lamp connection. It operates at the frequency rating of 50 - 60-Hz. It measures 14.31-Inch x 3.19-Inch x 2.63-Inch. Ballast meets FCC standards.